Sarah Nader- snader@shawmedia.com Aidan Mueller, 4, of McHenry practices dribbling while attending a McHenry Park and Recreation soccer camp at Chauncey Duker School in McHenry Tuesday, March 18, 2014. To keep kids active and having fun over spring break, the McHenry Parks and Recreation Department is offering a five-day camp. The camp is for children in first through fifth grades and runs from 9 a.m. to 3 p.m. starting Monday. Sarah Nader- snader@shawmedia.com Chloe Franklin (left), 6, of McHenry and Aidan Mueller, 4, of McHenry dribble around the gym while attending a McHenry Park and Recreation soccer camp at Chauncey Duker School in McHenry Tuesday, March 18, 2014. To keep kids active and having fun over spring break, the McHenry Parks and Recreation Department is offering a five-day camp. The camp is for children in first through fifth grades and runs from 9 a.m. to 3 p.m. starting Monday. 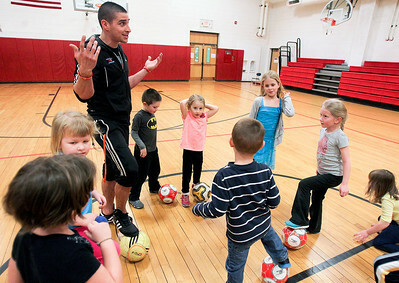 Sarah Nader- snader@shawmedia.com Coach William Klekovic (left) teaches a McHenry Park and Recreation soccer camp for 3 to 6- year-old kids at Chauncey Duker School in McHenry Tuesday, March 18, 2014. To keep kids active and having fun over spring break, the McHenry Parks and Recreation Department is offering a five-day camp. The camp is for children in first through fifth grades and runs from 9 a.m. to 3 p.m. starting Monday. 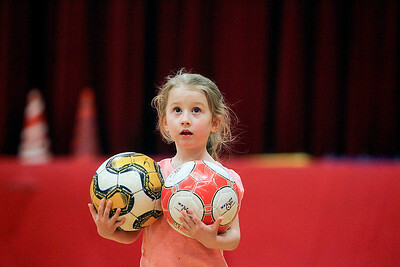 Sarah Nader- snader@shawmedia.com Anna Daleiden, 4, of McHenry runs around the gym picking up soccer balls while attending a McHenry Park and Recreation soccer camp at Chauncey Duker School in McHenry Tuesday, March 18, 2014. To keep kids active and having fun over spring break, the McHenry Parks and Recreation Department is offering a five-day camp. The camp is for children in first through fifth grades and runs from 9 a.m. to 3 p.m. starting Monday. 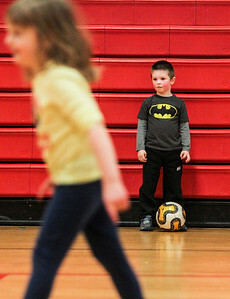 Aidan Mueller, 4, of McHenry practices dribbling while attending a McHenry Park and Recreation soccer camp at Chauncey Duker School in McHenry Tuesday, March 18, 2014. To keep kids active and having fun over spring break, the McHenry Parks and Recreation Department is offering a five-day camp. The camp is for children in first through fifth grades and runs from 9 a.m. to 3 p.m. starting Monday.